Links below will provide further information about our in-home plumbing. To see ALL disposals CLICK = >> Garbage Disposals | or just CLICK ABOVE DISPOSAL PIC to display the most popular model our plumbers stock on the truck. 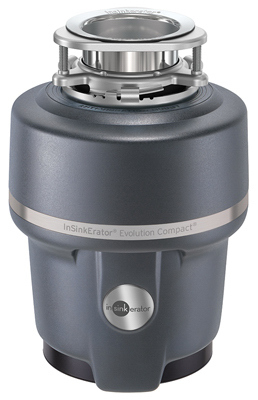 InSinkErator products are built for reliable, long-term performance. But, we know there are times that a garbage disposal or instant hot water dispenser may need servicing. * If the problem with your disposal is due to defects in materials or workmanship, InSinkErator may pay to have an authorized service center service the disposer in your home at no charge to you. - CLICK HERE for local warranty co.
1. Tip #1: Run Disposal Regularly. Run your garbage disposal on a regular basis. 2. Tip #2: Use Cold Water. 3. Tip #3: Run Disposal Longer. 4. Tip #4: Cut Waste into Small Pieces. 5. Tip #5: Grind Citrus Fruit. Make sure that the disposal switch is in the "OFF" position. Gently press the red button in to reset garbage disposal. Turn on a cold stream of water and turn the disposal switch to “ON” position, the disposal should now run again. To manually turn disposer's motor shaft first counterclockwise, then clockwise until the obstruction is dislodged and the motor shaft spins freely. F.Y.I. - like any appliance, garbage disposals, dishwashers, ice makers in fridge, etc. - Ed Young's Plumbing does not work on the appliance itself (no plumbing co. should) - we install them, hook them up, unblock etc. - another words we do the plumbing side of the job. - Otherwise we would void warranties (not good). <="" strong="">Thank you! - for visiting this section, and please feel free to contact us for more information, or to simply make an appointment with one of our plumbers.